Cast: Oleg Jankovsky, Erland Josephson, Domiziana Giordano, Patrizia Terreno. Instilled with a pervasive sense of melancholy, Gortchakov becomes profoundly alienated from his beautiful companion, his family, his country, and even himself. Eugenia attempts to engage him in a conversation over Arseni Tarkovsky’s (Tarkovsky’s father) poetry, but Gortchakov dismisses the book, reasoning that the simple act of translation loses the nuances of the native language. Eugenia then argues, “How can we get to know each other?” He replies, “By abolishing frontiers between states.” Yet Gortchakov’s words prove hollow as he remains distant and introspective, despite his surfacing attraction to sensual Eugenia. Gortchakov’s comment for the abolition of frontiers is a theme similarly explored in Tarkovsky’s earlier films, Solaris (1972) and Stalker (1979). However, while Kris Kelvin (Solaris) and the Stalker coexist in a metaphysical realm between reality and the subconscious, Gortchakov is profoundly aware of his physical separation from the beloved, distant homeland that consumes his thoughts, and it is his innate longing to find unity within himself that subconsciously guides him. Ironically, by wallowing in his own self-consumed longing and sense of incompletion, his actions become antithetical to his own thoughts on the abolition of frontiers, as he creates artificial barriers to isolate himself from his physical reality. While visiting the hot springs pool of St. Catherine in Bagno Vignoni, Gortchakov becomes intrigued by the presence of an eccentric old man named Domenico (Erland Josephson) who once imprisoned his family for seven years in an apocalyptic delusion. After asking Eugenia to translate some of the descriptive words used by the villagers to characterize the inscrutable Domenico, Gortchakov rationalizes, “He’s not mad. He has faith.” and asks Eugenia to act as an intermediary. Unable to convince Domenico to grant an interview to Gortchakov, Eugenia leaves in frustration. It is interesting to note that the visit to the pool of St. Catherine proves to be the catalyst that spurs Gortchakov to action. Historically, the therapeutic hot springs pools of Bagno Vignoni were constructed to alleviate the suffering of the ill. Furthermore, St. Catherine of Siena, after whom the pool was named, was an advocate for the reunification of the Eastern (Orthodox) Church and the Western (Roman Papal) Church during the Great Schism of the Ecumenical Church. Figuratively, Gortchakov, too, is a supplicant to the pool of St. Catherine seeking to heal the sickness within his divided soul. In essence, Gortchakov’s uneventful biographic research trip has evolved into a personal pilgrimage to find unity within himself. Domenico ultimately accepts the company of the attentive Gortchakov, and invites him to the abandoned house where he had kept his family in captivity. Domenico reflects on the folly of his actions as a desperate and selfish attempt to spare his family from a self-destructive and dying world. He implores Gortchakov to perform a seemingly innocuous task that he, considered mentally unstable by the villagers, is unable to execute: to cross the pool of St. Catherine with a lighted candle, as part of a greater redemptive design. Gortchakov is reluctant to undertake Domenico’s illogical request, but is intrigued by the fragmented messenger, and does not refuse him. He spurns the sensual Eugenia who inevitably leaves him, preferring to immerse himself in the solitude of his surreal memories and vague conversations with Domenico. Separated from his family, far from his homeland, and now alone, Gortchakov slips further into a state of profound isolation and unrequited longing, his own spiritual nostalghia. 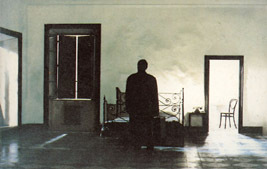 Tarkovsky’s personal struggle between love of country and creative freedom culminated during the filming of Nostalghia, and inevitably led to his defection to the West in 1983 with his wife, Larissa, leaving behind their son, Andriuschka, in the Soviet Union. Through the melancholic Gortchakov, Tarkovsky attempts to reconcile his own feelings of emotional abandonment, loss of cultural identity, alienation, and artistic need. The astonishing final shot shows Gortchakov in the foreground of an ethereal coexistence between the two worlds, as the Russian farmhouse becomes encapsulated within the arching walls of a Roman cathedral. It is both an idealized and an ominous closure, as the muted colors of the Russian landscape now suffuse the Italian streets, tainting them with the pallid hues of unrequited longing-a tenuous reunification of the spiritual schism within Gortchakov’s soul.